“Self-care” is one of those terms that gets thrown around a lot, but it’s one that is worth understanding. Activists and trauma professionals alike use this term to address a very real need to attend to one’s mental and spiritual health, especially when encountering triggering or draining subjects or events. For many who work in social work fields, or are activists on issues that carry emotional weigh-~-and of course, for those who struggle with their own issues in their own lives, be that a history of trauma or anxiety or just situational difficulties-~-self-care refers to the mechanisms by which we help uphold our own health and re-prioritize our own needs. As we work our way through Domestic Violence Awareness Month, I want to give a big shout-out to everyone who is experiencing this heightened awareness as an inundation with domestic violence stories, articles, and conversations. Having this discourse is obviously valuable, but especially for DV professionals and survivors, it can be triggering or further cause burnout. (And just as a reminder to all my readers out there, “triggering” doesn’t mean “makes someone feel uncomfortable”, it means “makes someone feel like they are mentally or emotionally re-living a traumatic experience”). To all of you I say, hang in there, and please don’t forget to take care of yourself! That said, we talk about “taking care of ourselves” all the time, but other than sleeping and making sure we consume food, what does that look like? Here are just a couple of self-care ideas and sites to take a look at if you are feeling overwhelmed, this month or ever. Reconnect with your spirituality. Go to your house of worship for a service, to talk to a religious leader, or just to sit and think. Reconnecting with this part of your identity, if it is a part of your identity, can sometimes help people feel renewed and refreshed. Make sure you’re eating well, not just eating. People tend to eat more when they are stressed, so make sure that what you’re putting in your body makes you feel good. If you can, keep healthy snacks like fruits, cut or baby vegetables, nuts, trail mix, or cheese sticks around, and try to make sure you’re eating balanced meals, with at least 2-3 food groups. Give yourself time to just sit and have a meal or a snack. Use food as a chance to take a brief break from all the other stuff-~-don’t just work through every meal, or read news articles about the thing that is adding to your stress. Give yourself a mental break. Read or watch TV programming just for fun. Don’t let the fact that an issue is important or speaks to an area of your life mean that it becomes The Thing in your life. People will tend to send you articles or videos about an issue if they know you care, and that can introduce some interesting ideas into your discourse, but it’s also important to make sure you engage with media you just enjoy, rather than media that forces you to re-engage with your work. Don’t be afraid to take yourself on a date. I’ll admit that there’s maybe a degree of financial privilege attached to this, though there doesn’t necessarily have to be. Go on a picnic by yourself and just bring a good book or a notebook to write in. Go to a movie by yourself, or just plan a night to stay in and watch a movie on Netflix with popcorn popped in your kitchen. Go to a local restaurant or get ice cream, and let yourself just enjoy it. There are all kinds of ideas for dates to take yourself on out there, so find one that appeals to you and go for it! Make sure you stay connected with friends. Isolation tends to increase feelings of depression, loneliness (shocker), and stress, so if you can, try to make plans with friends. They don’t have to be big or fancy or involve spending lots of money, they can just be a night of watching TV on the couch, or an afternoon of walking around in a park. If you live in a city, there are likely lots of free events or museums you can take advantage of if you want to go out, so don’t be shy. Even if you don’t want to talk about the things that may be bothering you, just spending time with people you like is important. Do little things that make you feel good. Paint your nails, do your makeup, wear a face-mask, take a bath, go for a jog, light some candles, play with your cat, take 10 minutes in the morning to stretch, whatever it is that makes you feel like, hey, this was a good moment today. It’s amazing how small good moments can make a big difference. Do something creative. Put together a single scrapbook page of a memory you like to look back on. Print out adult coloring sheets and let yourself spend some time just coloring (it’s very therapeutic). Get some blank paper and just draw. Not visually inclined? Let yourself write, make up a dance to a favorite song, decorate a cake, play some music if you know how to play an instrument. There are all kinds of ways to tap into creative energies and let them help you release stress. Give yourself credit for the little things you accomplish. Sometimes even just handling basic but important everyday tasks can be a struggle, so give yourself credit for actually getting them done. You could give yourself little awards, make a list of everything you’ve accomplished in a day/week (even, and especially, the mundane stuff), whatever you want to help you see that you are in fact handling things, even if it feels like you’re falling apart. Don’t forget to include things like remembering to take your medications if you have any, being compliant with treatment if you are struggling with a mental illness, eating regular meals, and making the list in the first place. Find a self-care strategy that makes sense for you. 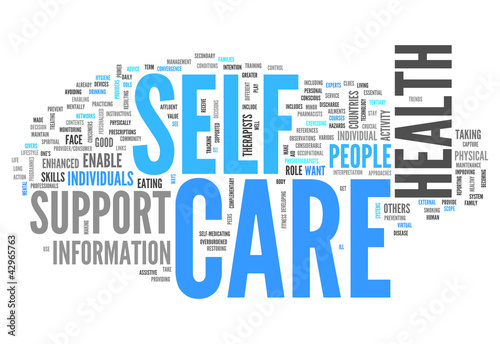 There are tons of resources online to help you explore and develop self-care plans, so pick things that make you feel good, and help you escape from the things that add stress to your life, at least for a few minutes. Take a look at some of these ideas here, here, and here. Maybe most importantly, don’t be afraid to admit to yourself or to tell others that you need to take time for these things. Self-care is part of both service and the healing process, and everyone has a need for it sometimes. Even after October ends, I hope you’ll keep in mind how important it is to take care of yourself, and develop strategies to do so that work in your life. Trauma, vicarious trauma, and just general stress are a part of many people’s realities, and there is absolutely no shame in realizing that they need to be addressed. ~ by Randi Saunders on October 9, 2015.